As someone who was once a real-estate agent and Feng Shui consultant, I’m always fascinated when I get to enter a home that I’ve never been in before. Even if you’ve known someone for years, seeing their space for the first time is like getting to see a whole new side to them. I love noticing the art they showcase, the trinkets they’ve brought back from travels and the unique sense of style they’ve tapped into to create this place that their soul can call home. Our homes are a reflection of our spirit. That’s why I’m shocked at how many homes I see where the residents have decorated each room to a tee, but haven’t designated a single spot in the home to only their spirit. A sacred space may not appear on traditional blueprints, but having a place where you can go to connect with yourself and the Earth is as crucial as any other room in your home. You don’t need a spare room to make some grand sacred space in, either. Creating a sacred space is just about dedicating a specific area to the rejuvenation of your spirit. For some people, that may mean creating a sacred altar, while for others it might just be a meditation pillow in a peaceful area of your home, or a spot outside that feels tranquil to you. Over time, when you go to the same place to do prayers, meditate, or do whatever healing work that speaks to you, there’s an energy that builds up. It triggers your mind to feel soothed the moment you enter that space because it subconsciously recognizes it as a space of relief. Whatever relics, crystals or sacred objects you place in this space will hold that energy for you. It doesn’t have to be ornate. For me, I always need something physical, so that I can retrain myself. I need the visual, physical element. I used to meditate all over the place in my home. Then, I found one spot that I realized I kept wanting to return to. I noticed that, over time, that energy was building. It was my go-to spot for decompressing the mind, body and soul. Deciding that area would be my sacred space was the turning point in my practice. Every time I went back to that spot, I felt my mind, body and spirit connect. The impact of that spot was the difference between going through the motions, and building that true connection. 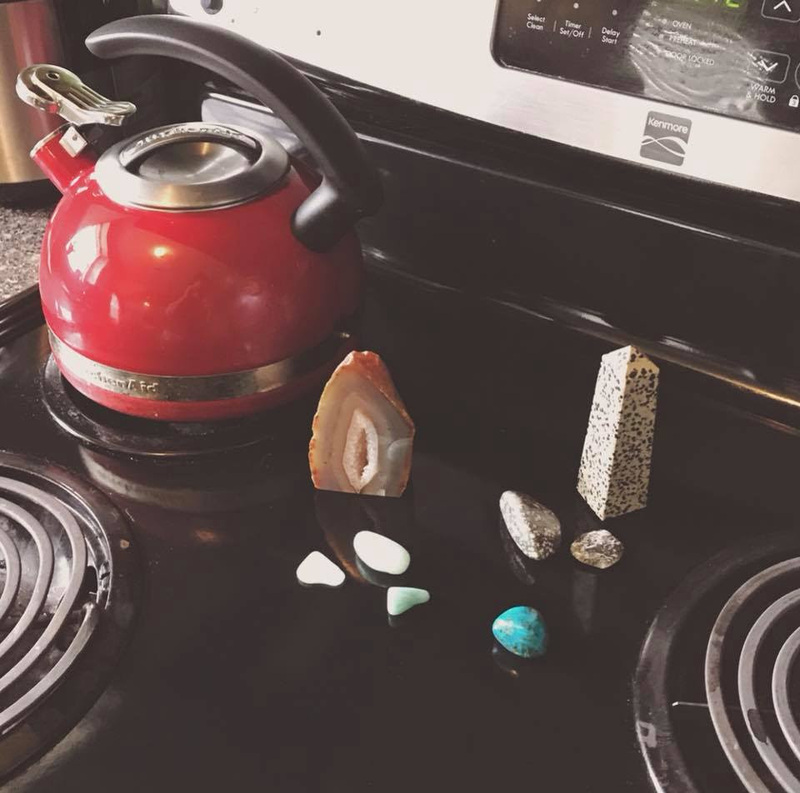 So if you’re looking to establish a sacred space of peace and connection within the home, here’s a few things to keep in mind before you start! There’s a Crystal for That! Today I will begin a 6-week series on crystals to use around your home. Many of us carry or wear our crystals to help us with various healing, but you can also set crystals around your home to promote certain atmospheres or help carry out specific intentions. When using crystals in your home, you can choose to display large crystals in the form of towers or spheres, or you may wish to be more subtle by hiding small tumbled stones in drawers or under sofa cushions. Whichever way you prefer will be perfectly fine and will have the same effect. For week 1, here is a list of crystals to use in your kitchen/dining area. The kitchen for many people is the hub of their home. This modern-day hearth is a high-traffic area for most families and tends to be a place where people gather when we have friends or family visiting. This is also the space where we nourish ourselves and our loved ones, which is why keeping this space energetically healthy can be very important. Here are 4 crystals to give your kitchen a spiritual remodel. 1. Agate – Agate has a very gentle, calming energy that is good for grounding and promotes overall wellness and longevity. 2. Amazonite – This stone opens both the heart and the throat chakra, promoting loving communication. It dispels negativity and is beneficial for calcium and mineral absorption. 3. Chryscolla – Chrysocolla purifies the environment in which it’s placed and promotes love and understanding. It can bring tranquility and serenity to the space, as well as bond family members together, improving the relationships between people by encouraging positive communication. 4. Jasper – All jaspers are known to be great nurturers. Whichever type of jasper you choose will alleviate stress and tension in the space and will encourage altruism and strengthen the family bond. It also clears electromagnetic and environmental pollution from the space, as well as work toward clearing emotional/mental negativity from the people sharing the space.